gentlytiptoe: more fabric, just what I need! Today I went to the quilt show at the three counties showground at malvern. I went last year, 8 months pregnant and with psd and hardly able to walk, and managed to walk around all day! This year was even better, what with the lack of pain. Andrew fantastically sat in the car with the kids reading childrens magazines and eating sweets and chocolate (yes, the baby too - not under my instruction I hasten to add - someone call social!). Anyway, I bought some nice new fabric and a few other bits and bobs, it being my birthday weekend and all that. We tend to have an extended birthday policy, you can spend as much as you can, and do what you like when its your birthday, and we always try to spin it out as long as possible. I have just tried to take some photos, but the elecric lighting really isn't doing any favours so I will try again tomorrow. 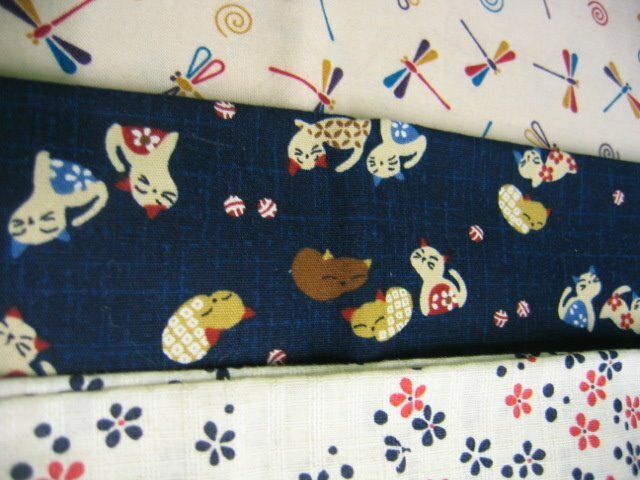 the photo above is about the best, some lovely Japanese fabrics that were the first things I bought. oh dear, more fabric, you'll have too hide it from your husband! !